Ensure you’re ready for the SY0-501 Security+ exam with quality content. We offer the following products to help you pass the first time. All questions include explanations so you’ll know why the correct answers are correct, and why the incorrect answers are incorrect. These questions are derived from and organized by chapters in the CompTIA Security+ Get Certified Get Ahead: SY0-501 Study Guide . See a demo here. At least 75 new multiple-choice questions in the extra test bank. Questions are added occasionally. You can see what has been added recently here. Four sets of performance-based questions including over 35 questions. These questions show you what you can expect in the live exam. They include drag and drop, matching, sorting, and fill in the blank questions. See a demo here. All of the end of chapter reviews from the CompTIA Security+ Get Certified Get Ahead: SY0-501 Study Guide to help you focus on important testable materials. Access to all of the online content that is available for free to anyone that purchases the CompTIA Security+ Get Certified Get Ahead: SY0-501 Study Guide . This includes labs, extra practice test questions, and supplementary materials. Supplement your studies with Security+ audio files you can listen to while on the go. Listen to key topics from all the chapters of the top selling CompTIA Security+ Get Certified Get Ahead: SY0-501 Study Guide , or focus on just the topics you want to brush up on. Note that these audio files are not the entire 608 page book which could easily be forty hours of listening time. Instead, they focus on key information to supplement your studies. Over one hour and 20 minutes of audio. After your purchase, you’ll receive a link to the download page to download these files. You’ll have access to the download page for 60 days but after you download the files, you can use them as long as you need them. Note that the Remember This audio files do not include all of the audio files. Supplement your studies with Security+ audio files you can listen to while on the go. Listen to the end of chapter questions and answers from all the chapters of the top selling CompTIA Security+ Get Certified Get Ahead: SY0-501 Study Guide , or focus on just the chapters you want to brush up on. Almost three hours of audio (2 hours and 53 minutes). Note that the Question and Answer audio files do not include all of the audio files. Buy both the Remember This and Question and Answer Audio Files for only $18.99 and you’ll also get audio of all the chapter reviews. Get audio of all Chapter Reviews when you purchase both Audio Sets for only $18.99. Over one hour and 40 minutes of audio. Reinforce key testable material with Security+ flashcards for the SY0-501 exam. These online flashcards are derived from content in the CompTIA Security+ Get Certified Get Ahead: SY0-501 Study Guide . The other side had the answer: 25. However, these are not paper-based flashcards. Instead, they are online digital flashcards. You can access them from any web browser and almost any computing device including desktop computers, laptops, tablets, and smartphones. They show one side and you click it (or touch the screen depending on your device) to see the other side. Click the right or left arrows to move to the next one or see the previous one. Some people ask why I don’t create paper-based flashcards. There just isn’t enough demand for them, and the cost to create them in small quantities would make the selling price significantly higher. These online flashcards include all of the Glossary items contained in the CompTIA Security+ Get Certified Get Ahead: SY0-501 Study Guide . You can use these to remind yourself of key words and phrases (along with a short definition) from the Security+ objectives. Acronyms can be challenging in any field, and you’ll find a fair share of acronyms you need to know for the Security+ exam. This online resource includes the relevant acronyms with a reminder of what they mean. CompTIA has a habit of using acronyms in their questions which really tests your knowledge of the acronyms. If you can simply say the words that are represented by the acronym, you often have your answer to the question and these resources will help. All of the “Remember This” blocks from the CompTIA Security+ Get Certified Get Ahead: SY0-501 Study Guide in an online slide format that automatically goes to a new slide after a short amount of time. You can hover over the slide to stop it or click through to see the next slide. 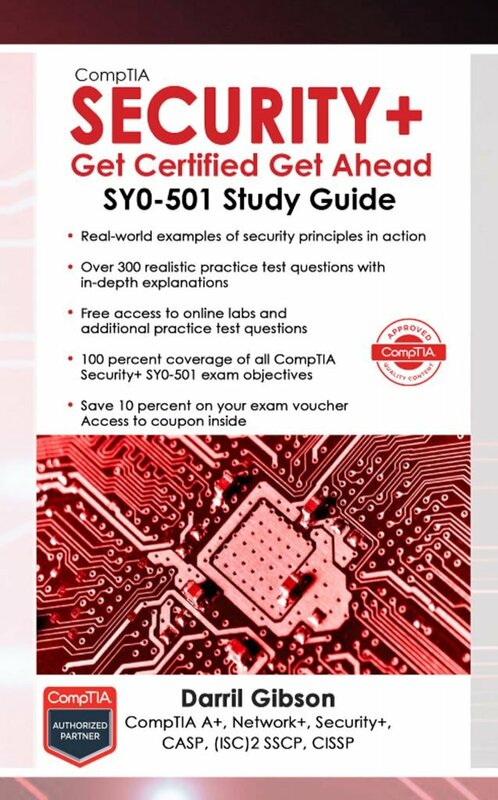 Bonus #1 Audio from the end of chapter reviews from each of the chapters in the CompTIA Security+: Get Certified Get Ahead: SY0-501 Study Guide . Over one hour and 40 minutes of additional audio. Bonus #3 Extended access. Access the study materials for a total of 60 days because sometimes life happens. Bonus #4 10% off Voucher. Access to a coupon code that will give you 10% off your exam voucher. At the current price of $330 USD for the Security+ voucher, this can save you $33. We have added the full text of the top selling CompTIA Security+: Get Certified Get Ahead: SY0-501 Study Guide in a full Security+ course. This course includes all of the multiple-choice practice test questions, performance-based questions, audio, and flashcards from the Security+ Full Access package but adds the text of the CompTIA Security+: Get Certified Get Ahead: SY0-501 Study Guide within an online course. Does This Include a Paperback Book? It includes the full text of the CompTIA Security+: Get Certified Get Ahead: SY0-501 Study Guide within an online course. Some people are confused by the phrase “full text.” If that is you, consider this. The words you are reading on this page are text. However, they are not a paperback book that you can touch and feel. Similarly, the text within the online course are words on web pages. It is not a paperback book you can touch and feel. Includes all of the content from the CompTIA Security+: Get Certified Get Ahead: SY0-501 Study Guide . Enhance your resume with the CompTIA Security+ certification. It is recognized by many employers and is also one of the key certifications required by the U.S. Department of Defense for military personnel or military contractors engaged in information assurance activities. Make sure you’re ready before exam day! Here’s what people are saying about the CompTIA Security+: Get Certified Get Ahead: SY0-501 Study Guide and packages on this site. Bonus #2 Access to all of the online content that is available for free to anyone that purchases the CompTIA Security+ Get Certified Get Ahead: SY0-501 Study Guide . This includes labs, extra practice test questions, and supplementary materials.